A close-up of chimney structures created in the Icy Worlds lab at NASA's Jet Propulsion Laboratory, Pasadena, Calif. Chimney structures like these can be found on the sea floor, surrounding warm, alkaline hydrothermal vents. (Phys.org) —Life took root more than four billion years ago on our nascent Earth, a wetter and harsher place than now, bathed in sizzling ultraviolet rays. What started out as simple cells ultimately transformed into slime molds, frogs, elephants, humans and the rest of our planet's living kingdoms. How did it all begin? A new study from researchers at NASA's Jet Propulsion Laboratory in Pasadena, Calif., and the Icy Worlds team at NASA's Astrobiology Institute, based at NASA's Ames Research Center in Moffett Field, Calif., describes how electrical energy naturally produced at the sea floor might have given rise to life. While the scientists had already proposed this hypothesis—called "submarine alkaline hydrothermal emergence of life"—the new report assembles decades of field, laboratory and theoretical research into a grand, unified picture. According to the findings, which also can be thought of as the "water world" theory, life may have begun inside warm, gentle springs on the sea floor, at a time long ago when Earth's oceans churned across the entire planet. This idea of hydrothermal vents as possible places for life's origins was first proposed in 1980 by other researchers, who found them on the sea floor near Cabo San Lucas, Mexico. Called "black smokers," those vents bubble with scalding hot, acidic fluids. In contrast, the vents in the new study—first hypothesized by scientist Michael Russell of JPL in 1989—are gentler, cooler and percolate with alkaline fluids. One such towering complex of these alkaline vents was found serendipitously in the North Atlantic Ocean in 2000, and dubbed the Lost City. 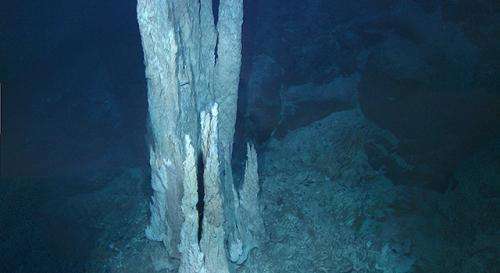 "Life takes advantage of unbalanced states on the planet, which may have been the case billions of years ago at the alkaline hydrothermal vents," said Russell. "Life is the process that resolves these disequilibria." Russell is lead author of the new study, published in the April issue of the journal Astrobiology. Other theories of life's origins describe ponds, or "soups," of chemicals, pockmarking Earth's battered, rocky surface. In some of those chemical soup models, lightning or ultraviolet light is thought to have fueled life in the ponds. The water world theory from Russell and his team says that the warm, alkaline hydrothermal vents maintained an unbalanced state with respect to the surrounding ancient, acidic ocean—one that could have provided so-called free energy to drive the emergence of life. In fact, the vents could have created two chemical imbalances. The first was a proton gradient, where protons—which are hydrogen ions—were concentrated more on the outside of the vent's chimneys, also called mineral membranes. The proton gradient could have been tapped for energy—something our own bodies do all the time in cellular structures called mitochondria. This image from the floor of the Atlantic Ocean shows a collection of limestone towers known as the "Lost City." Alkaline hydrothermal vents of this type are suggested to be the birthplace of the first living organisms on the ancient Earth. The second imbalance could have involved an electrical gradient between the hydrothermal fluids and the ocean. Billions of years ago, when Earth was young, its oceans were rich with carbon dioxide. When the carbon dioxide from the ocean and fuels from the vent—hydrogen and methane—met across the chimney wall, electrons may have been transferred. These reactions could have produced more complex carbon-containing, or organic compounds—essential ingredients of life as we know it. Like proton gradients, electron transfer processes occur regularly in mitochondria. "Within these vents, we have a geological system that already does one aspect of what life does," said Laurie Barge, second author of the study at JPL. "Life lives off proton gradients and the transfer of electrons." As is the case with all advanced life forms, enzymes are the key to making chemical reactions happen. In our ancient oceans, minerals may have acted like enzymes, interacting with chemicals swimming around and driving reactions. In the water world theory, two different types of mineral "engines" might have lined the walls of the chimney structures. "These mineral engines may be compared to what's in modern cars," said Russell. "They make life 'go' like the car engines by consuming fuel and expelling exhaust. DNA and RNA, on the other hand, are more like the car's computers because they guide processes rather than make them happen." "We call molybdenum the Douglas Adams element," said Russell, explaining that the atomic number of molybdenum is 42, which also happens to be the answer to the "ultimate question of life, the universe and everything" in Adams' popular book, "The Hitchhiker's Guide to the Galaxy." Russell joked, "Forty-two may in fact be one answer to the ultimate question of life!" 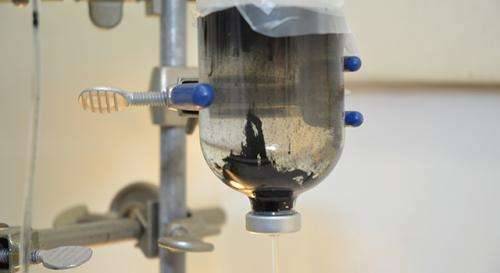 The team's origins of life theory applies not just to Earth but also to other wet, rocky worlds. "Michael Russell's theory originated 25 years ago and, in that time, JPL space missions have found strong evidence for liquid water oceans and rocky sea floors on Europa and Enceladus," said Barge. "We have learned much about the history of water on Mars, and soon we may find Earth-like planets around faraway stars. By testing this origin-of-life hypothesis in the lab at JPL, we may explain how life might have arisen on these other places in our solar system or beyond, and also get an idea of how to look for it."